It has always been a fairly well discussed subject over the past few years. Authentication is a big issue in Art. New technologies offered forgers new techniques to reproduce original prints. However, most of the time it is quite easy to spot fakes. Many dealers & many art professionales already warned buyers about looking into ebay to buy art. It’s true that there is a lot of fakes out there & especially on ebay. Nevertheless, ebay is also a great source when good deals can be made to the aware buyer. Yet, not everything that has been said is completely true. You’ll often hear that sellers on ebay will sell their prints without Certificate of Authenticity (COA) or with a bogus one. I’ll be really careful when seeing a print with a nice looking certificate. Those are often fakes. Most major artists have a foundation which is protecting the artist interest. If you’re looking for an original artwork like a painting or a drawing, buying art without the proper paperwork coming from the artist (if he is still alive) or his foundation basically means that what you have doesn’t have any value. To counterbalance this point, it’s fair to say that most foundations do not authenticate prints. If they do authenticate prints, remind yourself that they do not authenticate signatures & autographs. That said, it means that most people selling prints won’t have a Certificate of Authenticity which in the end is a good sign! They can have paperwork (like an invoice) from the place they purchased the artwork. Think about it : if you’re grandparents or your parents bought a print 30 years ago, do you think that you’ll be able to find an invoice. Most of the time you won’t but it doesn’t mean that you have a fake. Prints are most of the time fairly well documented. Some books exists which are called “catalogue raisonné”. Catalogue raisonné is simply a book where all the artwork (relevant to the medium it describes) is described and detailled. You will know important facts like year of creation, edition size, measurements, signature & its location…… Experts use those books to get the pieces of information they need to help them verify the artworks.That is why a print which doesn’t have the same image size than its reference in a catalogue raisonné will definately raise a red flag! Good ebay sellers will know about those books and will tell you the reference in the book of the print they are selling. It is usually (not always) a good sign for you that they know those. So try to make some research before buying something off ebay. You can ask most online galleries for help if you have any questions. Most of them will gladly take the time to answer you and give you their thoughts. 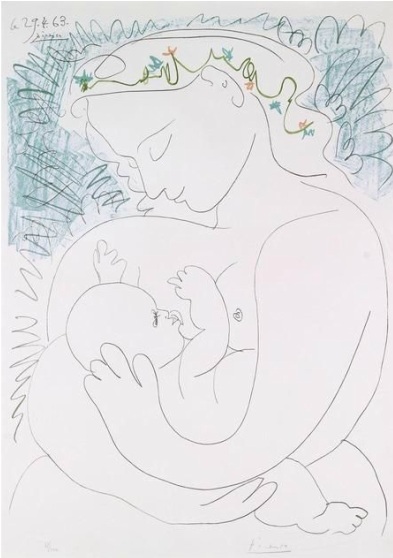 This print is called La grande Maternité. It was made after a drawing from Picasso. Purchased through a broker from Paloma Picasso in early 2004. The original lithograph printed in colors and hand signed in the lower right and numbered in the lower left. This piece being numbered 60 / 200 with an additional 25 being printed as Artist’s Proofs. Done on wove paper with deckled edge. Originally done for the Movement de la Paix du Mond ( World Peace Movement). 1) Be careful on the back stories. 2) The size is a problem without even looking into the content. The size of the original print should be 35 x 25 in ( 89 x 62 cm) and the image itself should be around 80 x 60 cm which is already more than the full size of the print for sale on ebay. It can be a difference of a few milimeters but you won’t find a difference of 15 cm! In theory, we wouldn’t really need to go any further. For the purpose of this article, I would like to go a little bit further. 3) In terms of terminology, it is described as an original lithograph. It’s simply not. Even the original one would be considered a collotype. By extension, you could call it an offset lithograph or an after print. What does it mean? An after or an offset differs from an original lithograph, on the characteristic that the artists didn’t draw directly to the stone. 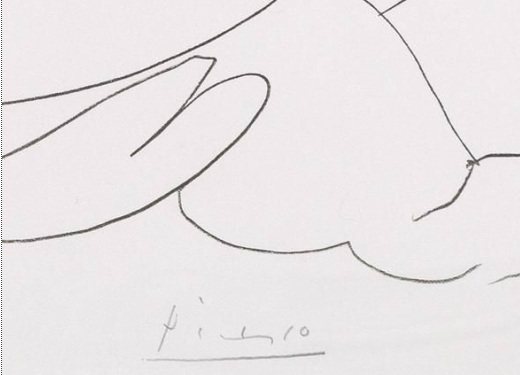 Here, Picasso made a drawing on paper, then it was transfered to a metal plate by transfer. The transfer was used to make the prints (not the original design directly). 4) The original doesn’t have that big margins. 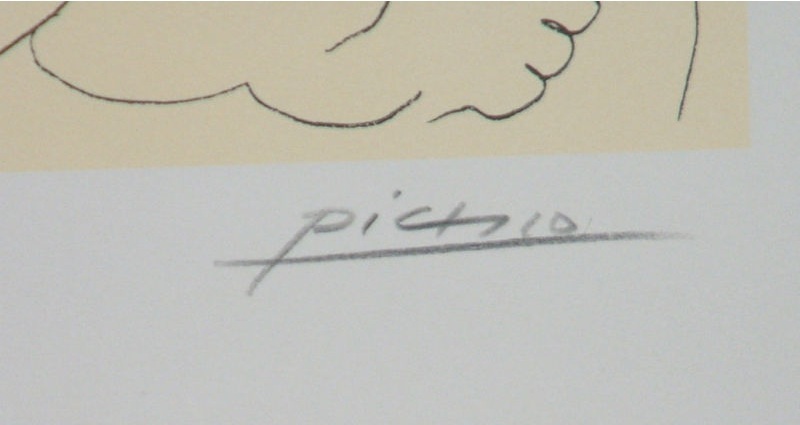 The positioning of the signature and the numbering is completely wrong compared to the original which is almost inside the image. 5) The signature is completely fake. 7) Finally, when you look at the 2 prints, the colours aren’t the same. The background of the image is a bit yellowish when the original is white. The colours are stronger and more defined in the original. 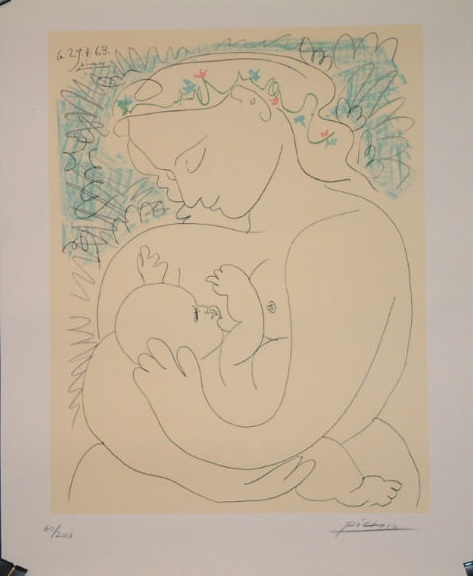 This entry was posted in General and tagged picasso fakes ebay prints art authentication art gallery. Bookmark the permalink.